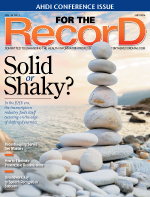 The task of reinvigorating coding departments to prepare for ICD-10 is complicated by the continuing skepticism surrounding the actual implementation of the new codes. Where's HIT Headed in 2015? Industry leaders discuss potential developments on the HIT landscape. As business associates, transcription organizations may be targeted in the next round of HIPAA scrutiny. The destructive properties of a data breach can be felt in virtually every aspect of the organization. Questionable documentation and coding practices can lead to important health care data being lost. A New York State data coordinator says a lack of proper EHR functionality may generate faulty birth certificate data. Rush University Medical Center has implemented a training program designed to find IT positions for veterans. Coding managers faced with staff members failing to meet productivity standards have several options to tackle the issue. To remain HIPAA compliant, health care organizations may want to avoid consumer wireless networks. The complaints and concerns have been coming fast and furious for the beleaguered incentive program. How will HIM departments face the strain of having to deal with more patients requesting their medical record be amended? Besides flaws in the technology itself, social factors within an organization can contribute to poor results. State legislators and health care organizations find it difficult to agree on what's a fair price for fulfilling medical record requests. The ONC's 10-year plan for interoperability hopes to bring more and better health information to the masses. When it comes to implementing health care technology, the complexities are magnified in children's hospitals. There's an avalanche of available health data, but is it trustworthy enough to improve patient care? There are plenty of available positions with not enough talent to go around. What’s the industry to do? Despite industry efforts to address quality assurance, HIM professionals remain concerned about the accuracy of transcribed care documents. Designed to better inform providers, MAC probe and educate audits have nonetheless left many hospitals frustrated. Today’s state-of-the-art operating room combines electronic recordkeeping with speech recognition concepts. 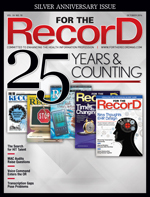 The author of For The Record’s first cover story reflects on how documentation has changed yet stayed the same over the past 25 years. 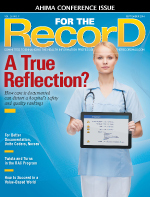 Editorial advisor Deborah Kohn chronicles the evolution of EHRs. Contributing editor Sandra Nunn recounts how her career path holds lessons for today’s HIM professionals. Chilmark Research’s latest report finds rapidly growing interest in analytics for population health, but solutions remain immature. As one hospital discovered, insufficient physician documentation can lead to misleading patient safety and quality scores. Industry complaints about how RACs go about their business have led to several planned changes. Industry experts discuss what it’s going to take for health care organizations to survive in a new environment. A new tool promises to help small providers, but it may need a bit of fine-tuning. Health care organizations looking to bolster their clinical documentation improvement programs would be wise to consider involving both nurses and coders. Use internal audits to get a jump on the ICD-10 transition and impress payers. Earlier this year, a data breach in which patient information was exposed on a transcription vendor’s website raised new concerns about security policies. According to a recent survey, industry experts expect clinical documentation to be a major concern both before and after the introduction of ICD-10. Finding and keeping qualified coders are keys to the success and happiness of HIM departments. With patients now able to grant portal access to others, the release of information process has become more complicated. Several factors play a major role in whether computer-assisted coding proves worthwhile. The technology offers many benefits, but measuring its financial success isn’t always straightforward. Don’t sit back and revel in the extra time Congress so awkwardly granted in April. Instead, take these five steps to keep the ICD-10 conversion moving forward. By following these 10 suggestions, health care consultants can ease the stress associated with technology implementations. A text messaging program helped at-risk pregnant women better manage their care. Documentation specificity is the goal of a new tool designed to enhance coding. 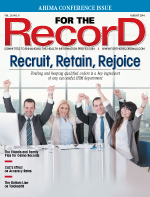 The transcription industry seems on the verge of extinction—then again, maybe not. Experts say if you take the extra time to be better prepared and well educated, the technology’s effectiveness is bound to be noticeable. 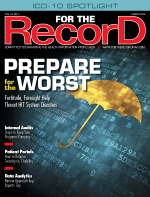 The proliferation of EHRs has complicated the creation and maintenance of health records that must satisfy patient care needs while taking into account legal concerns. By applying HIT tools and correct care management techniques, hospitals can lower costly preventable readmissions. An Arizona health care organization is using the ubiquitous, powerful smartphone to improve care inside and outside of its facilities. HIM graduate school programs are being established to give students a better chance of thriving in today’s health care environment. Malnutrition documentation can tie a coder’s stomach in knots, but it’s nothing that a heaping helping of advice can’t remedy. An Accenture survey indicates that patients are willing to table privacy concerns in order to view their medical records online. 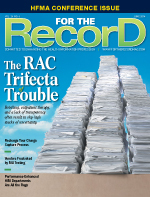 Make a list of the most perplexing recovery audit contractor concerns, and these three likely will be on it. Is your revenue cycle showing few signs of life? Try recharging the charge capture process, experts say. The hurdles of the stage 2 criteria are raising the ire of some in the vendor community. In this era of regulatory upheaval, process improvement initiatives take on added significance. A forward-thinking collaborative is helping Massachusetts health care organizations deal with the ICD-10 transition. The abolition of the 2014 ICD-10 deadline has left many in the industry wondering whether it’s foolish to believe any future mandates. To receive a proper return on investment from HIT, health care providers must analyze its performance in key areas. Health and Human Services has levied groundbreaking HIPAA fines stemming from stolen laptops. Besides being a website where patients can share their stories, HealClick has designs on becoming a valuable research tool. 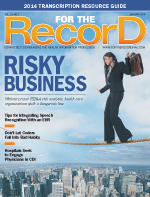 The consequences of duplicate records increase as patient data are spread across multiple organizations. Memorial Hermann Health System has developed an in-house coder training program for recent HIM graduates. 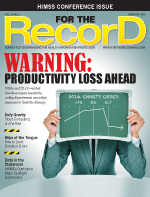 Moving paper charts into an electronic record-keeping system can stretch resources and shorten staff attention spans. Recent research identified areas of the country where the condition seems to be prevalent, but could the data be skewed by other factors? Federal programs have been hard at work trying to get HIT systems on speaking terms. Getting clinicians involved in template creation is one way to avoid the pitfalls of copy-and-paste documentation. Data normalization allows organizations to translate health languages into a common tongue. Research indicates that providing electronic access to clinical information across a community may boost care. Various federal factors and burgeoning technology have conspired to create logistical complications. 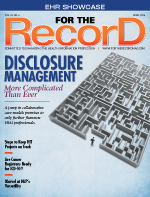 Are Cancer Registrars Ready for ICD-10? The code set may put a crimp in registry workflows. Industry veterans offer advice on what health care organizations must include in transcription vendor contracts. As natural language processing evolves, the health care industry is beginning to appreciate its range of uses. Today’s swirling regulatory environment makes corporate compliance a challenge at most health care organizations. Contrary to some perceptions, mobile health is an equal opportunity technology, serving both the advantaged and the underserved. It’s great that EHR adoption rates continue to climb, but it’s time to start thinking about how to make the best use of the data being generated. HIT projects can be messy affairs, but there are methods available to keep the madness in check. EHRs can be a useful tool to help clinicians educate kids and families about weight control. The Centers for Medicare & Medicaid Services has added data to its website to better help patients select the appropriate doctor. HIT systems are vulnerable to Mother Nature’s whims and other unforeseen events, making it imperative for organizations to have a backup plan in place. Experts say a narrow approach to data analytics is more likely to produce the desired results. Internal audits, whether they be coding or HIPAA related, can help providers stay ahead of new regulations. 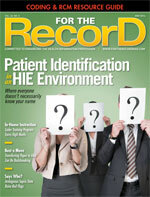 Patient portals must be mindful of data protection while satisfying user needs. Learn how medical transcriptionists are parlaying their skills into roles in clinical documentation improvement. 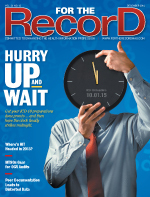 Coders contemplating handing in their codebooks come October should reconsider and instead embrace ICD-10. Findings from Nuance indicate that physicians prefer real-time queries in the quest for complete and compliant clinical documentation. An online exchange allows covered entities and business associates to monitor HIPAA compliance and risk management. An ICD-10 damage protection plan can help health care organizations limit the carnage. Dictation errors are inevitable, but there are ways to improve the chances of them getting caught. AHIMA’s 2014 curriculum maps pay special attention to the role of data stewards. Several factors have led to the cloud becoming a popular landing spot for health care data. Medical transcriptionists leery of their profession’s future may want to explore the idea of becoming a coder. The health care industry is adopting new best practices for getting major Wi-Fi launches and initiatives off the ground. An expert team has created software to determine EHR usability. Don’t underestimate Grandma’s and Grandpa’s desire to use the Internet for health care purposes. Indeed, according to a survey, many seniors seek digital tools to manage their health. Health care organizations that are ignoring or halfheartedly performing a HIPAA risk analysis are walking a dangerous line. To effectively engage physicians in clinical documentation improvement efforts, several key elements must be present. Experts analyze the circumstances that may lead coders to lapse. Tailor your strategy around these eight tips to increase your chances of a successful integration with an EHR. Learn how documentation and coding can affect core measures reporting. What challenges lie ahead this year for chief information officers? 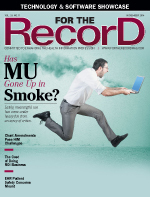 According to a KLAS report, an alternative computerized physician order entry shows promise as an EMR overlay. Learn the differences between range- and code-based approaches to ICD-10 mapping. An IDC Health Insights survey spotlights physician discontentment with ambulatory EHRs. A mobile eCapture solution promotes patient engagement. Two separate research projects demonstrate the Internet’s effect on physician selection and patient care.